The biggest issue with smartwatches right now is battery life – but it seems there may be light at the end of the tunnel after new technology created by university researchers has powered an e-watch with just wrist movement. The prototype device uses the wearer's movements to keep the watch working – it uses both electromagnetic and triboelectric energy conversion mechanisms through a single hybrid nanogenerator. Similar things have been done before to power smartwatches, but they only used a single type of energy conversion and weren't powerful enough to keep the device running on full. The scientists who created the prototype are Ya Yang at the Beijing Institute of Nanosystems in China and Zhong Lin Wang at the Georgia Institute of Technology in the US. Yang told Phys.org, "This kind of nanogenerator can also be utilized to power other wearable electronic devices, such as a wireless smart pedometer for reading data on walking steps, distance, and energy consumption." The application of this technique could be an interesting way of solving the battery problem for a number of smartwatches. The prototype device isn't exactly as slim as an Apple Watch though, so there's going to need to be some serious work to get it narrowed down to a useable size. 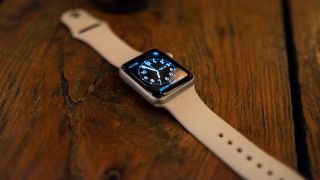 Having to move your wrist to power the watch may get annoying for some. If it can hold energy from walking for a while it would make sense, but we don't particularly want to be sat at our desks shaking our wrists just to tell the time. But it's all a step toward solving the smartwatch battery life problem, and the faster it's worked out, the better for us.